With the increases in the price of oil and pressure on roads the whole question of public versus personal transport again comes sharply into focus, and a little light on the subject is needed. There are a lot of misconceptions about public transport, which makes comparison of what is offered difficult. When the government of the day considered allowing building of rail track along the south coast it was initially seen as important for defence. In 1845 Brighton, Lewes & Hastings Co was given leave to create a line between Hastings to Ashford and the 27 miles of track was opened on 13th February, 1851, but even then a condition was imposed that it would be run by SER, owners of a London line to Ashford. Rye Station was built, together with Ham Street and Appledore. Ore Station was not created until January 1888, and Three Oaks Bridge and Doleham Crossing (Guestling) and Snailham Crossing were added in July 1907. Amongst the plans for the additional line from Appledore to Dungeness in the 1870s, was the creation of a harbour and ferry sailings to Le Treport, in France, which would enable the journey London/Dungeness, ferry, Le Treport/Paris. Euro Star through Ashford has fulfilled this dream at last. A single-track goods line from Rye to Rye Harbour opened in March 1854. With a break during the war, the Appledore/ Dungeness line continued into the 1960s with a two hourly service of 12 trains in summer weekdays and 5 on Sundays. On the Hastings/Ashford line there were 20 steam trains weekdays each way, running an hourly service with additions in rush hours. The journey took approximately 43 minutes. On the change to diesel/electric, numbers of trains were cut at the lowest to 11 each way, and the journey time took 50 minutes. Now with the arrival of the new turbo/diesel Class 170 trains comes a step forward into the 21st century travel, with services back to 18 trains both ways on weekdays, 16 on Saturdays Page twenty-two Page eleven and 12 on Sundays and the journey time cut to 47 minutes. The plan for 2005 is that arrival of more trains allowing a through service from Ashford to Brighton without changing. Things are looking up. Looking at bus travel, coaches still come to Rye in greater numbers than the old charabanc of pre-war years. They also cover much of the school runs for children. Along the coast and from the villages the changes in routed buses are more complex. 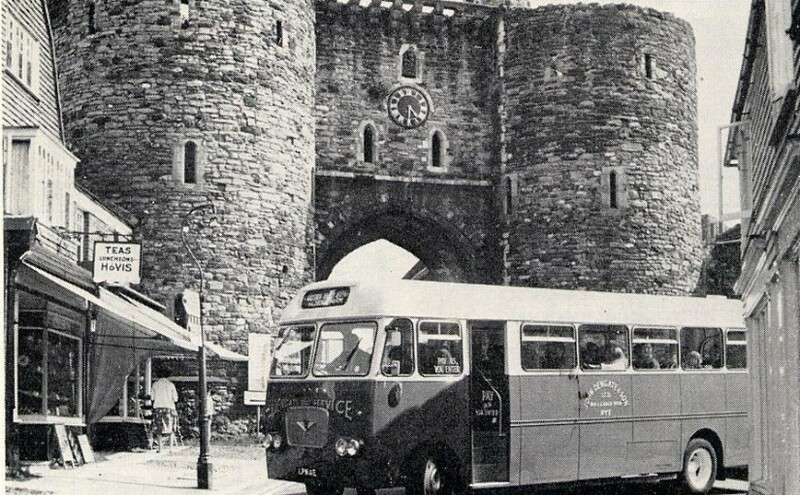 For years from the 1930s Dengate Buses ran services into Rye from the villages. This has largely been taken over by Coastal Buses, with the addition of a few numbered services by J & H, Rambler and Renown Coaches. A relative newcomer in the last few years is Stagecoach, who now offers services from Hastings to Dover. A major change has been in the Rye Community Buses, Dial-a-Ride and other schemes to fill in gaps in transport provision, but are not only there for disabled or special needs travellers. They largely rely on volunteer drivers and deserve much praise. Buses are not in competition with train services; in this area they complement each other. On the 20-25th September, with the support of all transport providers and Rye’s Town Manager, a display outside Budgens will try to answer many of the questions of just what is being provided for the travelling public and dispel some of the misconceptions. Do you believe public transport is too expensive? The actual cost of driving an average car, taking into consideration all expenses, is calculated at 40p per mile. Do you know all the special offers there are for the family and whether you are entitled to a bus pass? Come and have a look and then make up your mind if the car is always the best answer.